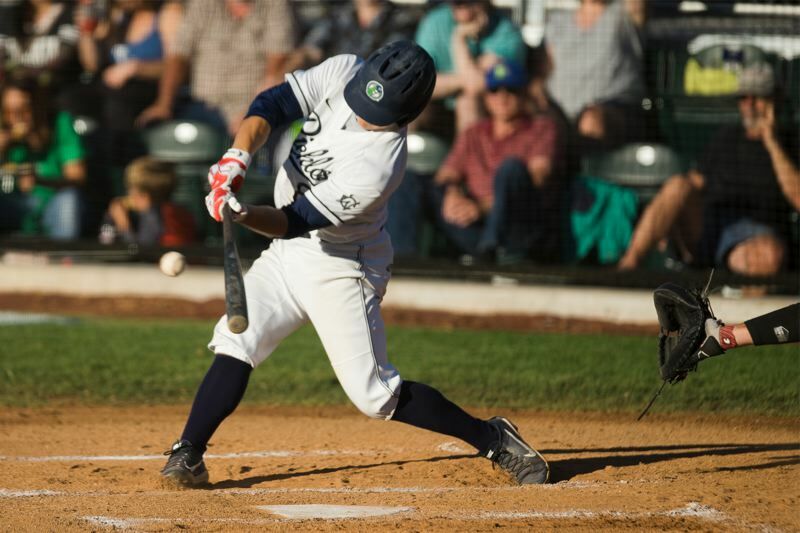 Nothing went right for Portland Pickles designated hitter Mikey Perez in his first three at-bats against the Walla Walla Sweets on Tuesday at Walker Stadium. His first two plate appearances resulted in flyouts. Perez, who graduated from high school in June and is headed to UCLA, then struck out with the bases loaded in the sixth inning and the Pickles trailing, 7-6. A solo home run from left fielder Jake Berry (Utah Valley) evened the score one inning later. With the teams still tied in the eighth, Perez, penciled into the cleanup spot by manager Justin Barchus, came to the plate with two runners on and two out. First baseman Jace McKinney (University of Portland) had led off the inning with a single and advanced to second on a sacrifice bunt. The Sweets then elected to intentionally walk right fielder Zander Clarke (UC San Diego), who had hit a solo home run in the fifth. Before Perez strode to the plate, Barchus pulled him aside. "I just told him to relax and believe in himself," Barchus said. "That's the hardest thing for a young kid to do in a situation where he experiences a little bit more failure than usual." After pausing to take a couple of deep breaths, the Cerritos, California, native dug in. Perez took a few pitches, then uncorked a fastball from reliever Ryan Johnston beyond the left-center field trees to score three runs and propel the Pickles to a 10-7 win. Many of the announced crowd of 2,347 fans had left the ballpark, but those who stuck around joined the Pickles (19-11) in saluting Perez as he touched home plate. "I didn't predict the home run, but he's the right guy," Barchus said. "There's a reason I didn't pinch-hit for him. He's the guy we wanted in that spot." Perez's third HR in 19 games played during the summer season helped the Pickles snap a two-game losing streak. Portland had dropped back-to-back league games to the Kelowna Falcons in British Columbia on Saturday and Sunday. The blast also broke Perez out of a hitting slump. HE was 2 for 14 in the previous five games. He is batting .222 with nine RBIs this season. The 6-1 infielder has been forced to take a different approach at the plate in facing college pitchers for the first time. "I think for him, it's just overcoming adversity," Barchus said. "He's going to be an amazing player at UCLA, but I think he's experienced a little bit of failure that I don't think he's experienced in the game of baseball before. That's worn on him a little bit, mentally." Portland had hit a rough patch after clinching the WCL first-half South Division title on July 4. The Pickles dropped a home game to the Cowlitz Black Bears, 7-1, on Thursday, then lost just their third league series of the summer to Kelowna on Sunday in a 9-4 defeat. With one of the league's four playoff spots in hand and home-field advantage secured for the first round, Barchus and players then had to decide what direction to take the second half of their season. "After the Kelowna series, we had a little bit of a come-to-Jesus meeting, if you will," Barchus said. "Just about how we're going to approach the second half and how your character is more important than the wins and losses in the second half. I think they showed up today with intent and purpose, and they never quit. " Portland rallied from early deficits twice against the South rival Sweets (17-14). With Portland starter Michael Frias (UC Irvine) on the mound, Walla Walla took a 3-0 lead. Three straight singles plated a run in the second inning, and a hit batter led off the third before a two-run home run. The start pushed Frias' ERA to 6.23 in five appearances. Portland scored two runs in the bottom of the third on an RBI single from Clarke and a delayed steal that led to a throwing error by Sweets catcher Robert Teel (Washington State). Clarke's WCL-leading eighth homer of the summer in the fifth knotted the score. After reliever Leo Nierenberg (University of Washington) struck out seven of the first nine batters he faced, he walked a pair with two out in the sixth. Walla Walla then used three RBI singles to take a 7-3 lead. Center fielder Joey Cooper (Cal State Northridge) responded with a leadoff homer (his seventh HR this summer) in the bottom of the sixth. Three at-bats later and with runners on second and third, second baseman Carson Breshears (Gonzaga) hit an infield single that scored two on a wild throw to first from the shortstop. "It was an important win," Clarke said, recalling how Portland had lost two of three at Walla Walla, June 22-24. Walla Walla finished 2 1/2 games behind Portland in the first-half standings. The Corvallis Knights took second place and were a game-and-a-half back of the Pickles. Through Tuesday, Corvallis has the second-half lead at 2-0, with Cowlitz 3-2, Portland and Walla Walla 2-2, and the Bend Elks 3-4. Barchus said he is not looking at the series with Walla Walla as a potential preview of a playoff series in August. "It's not that I don't think they're going to make the playoffs," Barchus said. "I think Walla Walla has as good a chance as anybody, but that's just not how I approach (teams). "We approach everyone the same. We approached Kelowna a little bit differently, but that's just because we hadn't seen them before." Portland's win also highlighted the loss of two of its best pitchers. Former starter John Beller (USC) and closer Brad Bonnenfant (Nevada) were sent home last week after being shut down by their college teams. Both the Trojans and Wolf Pack coaching staffs told the Pickles their innings limit had been reached. USC wants Beller, a soon-to-be sophomore left-hander, to become a weekend starter. Bonnenfant is a righty and senior-to-be who is expected to be Nevada's closer next season. Tuesday would have been Beller's turn to start on the mound. He had pitched in front of lefties Brad McVay (UP) and Michael Newstrom (WSU), who are projected to start on Wednesday and Thursday, respectively, in the rotation. Beller posted a 0.48 ERA with 24 strikeouts in 18 2/3 innings. "It's next guy up with our pitching staff," Barchus said. "When they get the opportunity, I think our guys have done a good job of stepping up." Without Bonnenfant, Barchus turned to righty Adam Davenport (UW) to close the game. The 6-5 sophomore-to-be worked around a hit and a walk with two strikeouts to claim his first save. He has not allowed a run in six relief appearances. Bonnenfant converted six of his seven save opportunities and struck out 14 in 9 1/3 innings. "We have to come up with another solution on the back end," Barchus said. "Adam's back there, and I think we have another option, but you'll have to wait and see on that one." Righty Brett Walker (University of Oregon) held the Sweets to one hit over 2 1/3 innings to set up Davenport and go to 2-0. Clarke, Breshears and McKinney each finished with two hits. The Pickles and Sweets will play Game 2 of their midweek series at 7 p.m. Wednesday at Walker Stadium. Barchus has two of his better arms ready to go in McVay and Alex Roth (Western Oregon). They pitched on June 29 and on Thursday and have not allowed a run in their last 14 combined innings. McVay is 4-0 in six appearances with a 0.39 ERA. He has 29 strikeouts against seven walks in 23 innings. Roth has not allowed a run since giving up a pair in his first start of the season on June 1. The 6-5 righty has a 1.50 ERA and has struck out 14 over his last seven innings. Walla Walla will start Haydn King (2-1, 3.15 ERA) out of the University of San Francisco.